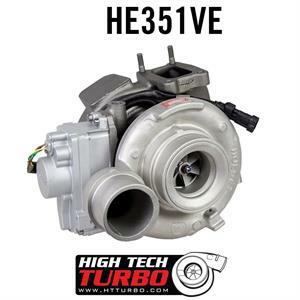 We are proud to offer the High Tech Turbo line of Turbo Chargers. Whether you choose a brand new charger, or opt for the value driven remanufactured line, you can feel confident you are making the correct decision. We offer a 1 year unlimited mileage warranty on all HTT Turbos. Proper installation is critical for the livelihood of ANY new charger. Ensure your engine oil is not contaminated. Test/verify you have ample oil delivery from your supply line. Ensure your oil return line is of adequate size, has an acceptable grade & there are NO restrictions in it. LUBE your new charger PRIOR to starting your truck. Use a squeeze bottle (a gear oil bottle spout on a plastic quart oil bottle works well) and fill the oil inlet of your new charger. Spin the compressor wheel by hand to completely fill the turbo cartridge and minimize any air pockets. When starting the engine for the first time with a new turbocharger, idle the engine for a minimum of five minutes, checking all connections & ensuring there are no leaks. Look & listen ! Does anything seem/sound out of the ordinary ? Take your truck for a short casual warm up drive (5-10 miles, no boost). Pull over in a safe location & go back over the install visually (careful it's HOT!) Is it still dry & leak free? Everything sounds good? Excellent! Driving an additional 5-10 miles under moderate boost conditions (5-15 lbs) will allow your new charger friction surfaces to mate properly. An additional 25 miles of conservative driving, followed up with a final inspection should assure you of a long life with your new charger. To ensure long turbocharger life: Let the turbocharger cool down before shutting off your engine (Sub 300 degree shut off EGTs are suggested). Stay on top of your vehicle maintenance with regular oil changes. Take good care of your new Turbocharger & it will take good care of you !